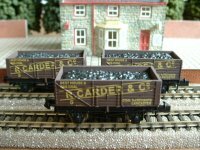 Three of our R.Carder and Co. open wagons. 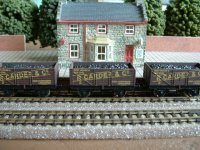 They might only have been a local coal merchant, but when demand from the homes and factories of Lancaster was high then Carder would have been shifting their best quality coal as fast as they could bag it up. 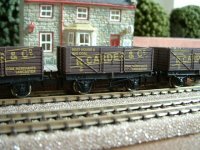 One wagonload would have been snapped up in no time, so 2 or 3 of their modest fleet would have been coupled up and sent off to the colliery to bring back more stocks to Carder�s coalyard. 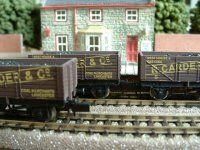 A cold snap in those days would soon have had the coal merchants, the mines and the railways rubbing their hands.